What does OTEC stand for, and why is it important? Ocean Thermal Energy Conversion (OTEC) is a unique source of renewable energy that provides stable power, 24 hours a day, 365 days a year, and does not require energy storage systems. Unlike other renewable energies, the maximum available energy from OTEC is not limited by land, shorelines, water, environmental, or human impact. OTEC is dispatchable power that can ‘load follow’ and ramp up and down rapidly to accommodate for fluctuations in power supply from intermittent sources like wind and solar. 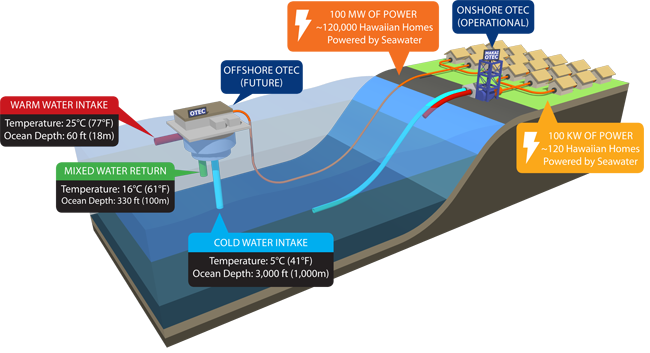 OTEC is a process that produces electricity by using the temperature difference between deep cold ocean water and warm tropical surface waters. OTEC plants pump large quantities of deep cold seawater and surface seawater to run a power cycle and produce electricity. The major components of this system are: the seawater pipes, especially the large/long/deep cold water intakes; the heat exchangers that are used to “extract” the heat from the water seawater, and return it to the cold seawater; and the power cycle using a refrigerant.  Warm seawater passes through the warm-side heat exchanger (called an evaporator), which heats up the working fluid (ammonia) until it boils and becomes high-pressure vapor. The ammonia vapor then passes through a turbine, which turns a generator making electricity. The lower pressure ammonia vapor leaves the turbine and condenses in the cold-side heat exchanger (condenser) that is flooded with a flow of deep cold seawater. The liquid ammonia leaves the condenser and is pumped to the evaporator to repeat the cycle. A device that allows heat to ‘exchange’ between the seawater and another working fluid, but without allowing them to mix. In the warm-side heat exchanger (called an evaporator) the warm seawater ‘heats up’ the working fluid until it boils. In the cold-side heat exchanger (called a condenser) the cold seawater cools down the working fluid vapor until it returns to a liquid state. Why are heat exchangers so important for OTEC? Heat exchangers make up about 1/3 of the cost of a 100MW OTEC plant. Therefore, the primary focus of the 100-kilowatt facility is heat exchanger design, testing, and evaluation. Any slight reduction in cost, improvement in efficiency, reduction in size, or extension of life will go a long way towards improving the economics of OTEC. How big are the heat exchangers? Is OTEC onshore or offshore? It can be both. The current plant is onshore. Much larger plants would be offshore because at large sizes it is more cost effective to have an offshore plant with a vertical cold seawater intake pipeline hanging below it, rather than having to trench and bury or tunnel it across the shoreline for an onshore plant. How large and deep are the cold water intake pipes for the existing 100kW plant, and for future 10MW and 100MW? The cold water intake pipeline for the current 100 kW OTEC plant is 40 inches in diameter, bringing water from a depth of about 2,200 feet. For an offshore 10 MW OTEC plant, the vertical cold water intake pipes would be about 13 feet in diameter, bringing water from a depth of about 3,300 feet. For an offshore 100 MW OTEC plant, the vertical cold water intake pipes would be about 33 feet in diameter, bringing water from a depth of about 3,300 feet. What is Makai’s experience in large marine pipelines for OTEC? In 1979, Makai designed the cold water intake pipe and mooring for “Mini-OTEC,” the world’s first net-power producing OTEC plant. The plant was located on an offshore barge in Hawaii. In 1986, Makai designed and oversaw installation of the 40” diameter, 2,200’ deep seawater pipe that currently serves our OTEC power plant. In 2001, Makai designed the 55” diameter, 3,000’ deep seawater intake pipe that serves other water bottling tenants. This is the largest and deepest intake in the world. Makai has designed and oversaw the construction of many other marine pipelines since 1979. Click here to learn more about Makai’s pipeline experience. Is Makai working on a large, offshore facility? Currently, Makai is aimed at reducing costs and improving the economics of both mid-sized and large-scale offshore OTEC plants. In order to attract investments to build a plant of that size, developers will first need to validate the technology of a 5-10 megawatt offshore OTEC plant for several years. Is the 100-kilowatt facility designed for commercial power production? No. Makai’s primary purpose is for research, design, testing, and evaluation of OTEC heat exchangers – a main component in an OTEC plant. Will Makai sell the power produced from this facility? Makai is in discussions with Natural Energy Laboratory of Hawaii Authority (NELHA) to sell excess power at a rate similar to the Public Utilities Commission official “Feed in Tariff” rate of approximately 19 cents per kilowatt-hour. The power being produced will power seawater pumping, and excess electricity will be sold to NELHA to further sustain Makai’s research and development of OTEC technology at the plant. How did Makai get involved in OTEC? Makai’s first “Mini-OTEC,” project was completed in 1979 and kicked off Makai’s nearly 40-year involvement of OTEC. Since then, considerable resources have been directed to OTEC’s research and development in order to generate power for public consumption at 20 cents per kilowatt-hour. Are other countries investing in OTEC? Yes, Japan, China, Korea, Philippines, Malaysia, France, and the Netherlands have their own research and development programs. Makai estimates that global OTEC investments have surpassed $100 million since 2009. What is your relationship with HECO? HECO is supportive of the OTEC project, and have assisted Makai with their electrical grid interconnection of the 100-kilowatt OTEC plant. What is your relationship with the U.S. Navy? Dependence on foreign oil is a major security risk for the U.S. Navy and thus, has been the primary sponsor of Makai’s OTEC work since 2006. The Navy has aggressive clean energy goals, and views OTEC as a base load renewable power source (capacity factor around 95%) that can offer higher energy security than other renewables. What is your relationship with Lockheed Martin? Lockheed Martin has been an important partner in developing OTEC. Makai is a small company and thus we need larger partners to implement large-scale systems. At Makai’s current facility in Hawaii, Lockheed has hired Makai to test their OTEC heat exchangers (the ones you see on the sides of the facility) and for research, development and testing on corrosion-resistant materials. What’s the relationship with Hawaii and Okinawa, Japan? Hawaii and Okinawa have had a strong partnership since 2010 with the formation of a Japan-U.S. clean energy agreement, and a Hawaii-Okinawa agreement, which was recently renewed this summer by Governor of Hawaii David Ige and Takeshi Onaga, Governor of Okinawan Prefectural Government. One project being considered as part of that agreement is a jointly developed 1MW class OTEC system. Okinawa currently has a similar, OTEC cycle in operation, and thus Hawaii and Okinawa are considering combining resources to jointly build a larger 1 MW class OTEC plant together. On Wednesday, August 19th 2015, Makai, NELHA, and a Japanese consortium of companies agreed on a memorandum of understanding with the intention of jointly building a 1 MW class plant at NELHA. Who are the primary sponsors of the OTEC plant? Naval Facilities Engineering Command (NAVFAC) funded the infrastructure. Office of Naval Research (ONR) and Hawaii Natural Energy Institute (HNEI) funded the ongoing research involving heat exchangers, turbine-generator, and control systems. U.S. Department of Energy and the Hawaii Natural Marine Renewable Energy Center (HINMREC) supported corrosion testing.